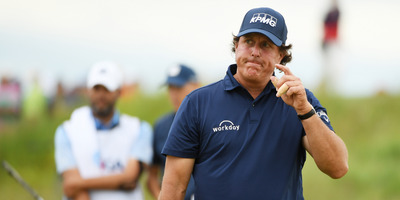 Ross Kinnaird/Getty ImagesPhil Mickelson apologised for his bizarre outburst at the US Open, saying that he is ’embarrassed and disappointed’ by his actions. Phil Mickelson has apologised for his outburst at the US Open, saying that he is “embarrassed and disappointed” by his actions. Mickelson had caused a stir at the tournament after his blatant rules violation, hitting a still-moving ball that was in the process of rolling off the green. Shinnecock Hills, the course that hosted the US Open, frustrated many of the best golfers in the world over the four rounds of play. Phil Mickelson has apologised for his outburst at the US Open that saw him take a two-stroke penalty for a blatant violation of the rules. “I know this should have come sooner, but it’s taken me a few days to calm down,” Mickelson said. Mickelson caused quite a stir at the US Open on Saturday when he intentionally putted a ball that was still rolling. At the 13th hole at Shinnecock Hills, Mickelson had lined up to putt for bogey but sent the ball past the hole. With the greens notoriously fast that weekend, it appeared that Mickelson’s putt would roll all the way off the green, but rather than let that happen, Lefty ran over to his still-moving ball and putted it again back towards the hole. Commentators and analysts were stunned by the move, and some would later call for him to withdraw from the tournament. Ultimately, Mickelson was given a two-stroke penalty for his infraction, finishing the hole with a 10 and the tournament tied for 48th with a score of +16. The apology comes after some initial defiance on the matter from Mickelson. Now further removed from the frustrations that strained the entirety of the talented field at Shinnecock Hills, it appears Mickelson has a bit of remorse for his actions.